MR. COUGHLAN: May it please you, Sir. Before I commence this outline statement, I’d just like to say that we have been informed by Guinness & Mahon that they wish to ask some questions of Mr. Doyle, who gave evidence yesterday, and we are attempting to make arrangements for that particular purpose. The first matter is the fact that funds from the Fianna Fail Leader’s Allowance appears to have been lodged to an Amiens account in Guinness & Mahon, one of the class of accounts from which payments were made to or for the benefit of Mr. Haughey. The second matter relates to payments made to Mr. Haughey from Irish Permanent Building Society. Dealing with the Leader’s Allowance first: The Leader’s Allowance is the expression used to describe payments made from Central Funds to the Party Leaders to assist them in financing the political activities of their parties. The control of the funds is with the Political Parties to whose leaders the payments are made. Typically, the allowances are used to pay for salaries and expenses of party officials employed to assist the parties or Party Leaders in their Parliamentary activities. At any time, the Government party invariably has direct access to the resources of the Civil Service for Government, Parliamentary and other political assistance. For this reason, it is recognised that parties in opposition should receive, through their leaders, a larger allowance than parties in Government. Subject to this quite proper differential between the Government and Opposition parties, the allowance is, in general, calculated by reference to the size of the Parliamentary representation of any political party. The Tribunal’s attention has been drawn to the Party Leader’s Allowance in the context of the Amiens accounts. I have already referred to these accounts and they were accounts in Guinness & Mahon bank controlled by the late Mr. J. Desmond Traynor, through which large sums of money were channelled to Mr. Charles Haughey and from which payments were made to or for the benefit of Mr. Haughey. From an examination of documents made available to the Tribunal by Guinness & Mahon bank, a lodgment of £25,000 on the 20th June, 1989 to Amiens account number 12180001 has come to the attention of the Tribunal. It’s on the overhead projector now. This was an account which was operated between the 3rd February, 1989 and the 12th January, 1990. The total sum credited to the account was £191,380.39. The pattern of credits and debits to the account was of frequent small transactions but the £25,000 lodgment on the 20th June, 1989 was one of the exceptions to this pattern, and I think that will be obvious from the account shown on the overhead projector. From the bank’s internal documentation for the 20th June, 1990, it appears that this credit represented the lodgment of a cheque for £25,000 and that this cheque was drawn on Allied Irish Banks, 1 Lower Baggot Street, Dublin 2, the account of Haughey, Ahern and MacSharry. The cheque was dated the 16th June, 1989 and it appears to have been signed by Mr. Bertie Ahern and Mr. Charles J. Haughey. I should say that the account Haughey, Ahern and MacSharry was of course the Leader’s Allowance account. The Tribunal has examined the administration of the Party Leader’s Allowance by Fianna Fail during the period of Mr. Haughey’s leadership and also in the period since he ceased to be leader. 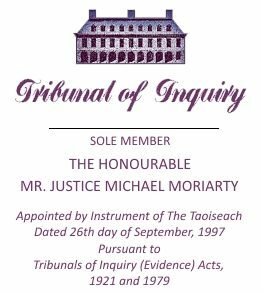 The Tribunal has obtained Memoranda of Evidence and statements from Ms. Eileen Foy, who was involved in the administration of the account; from Mr. Bertie Ahern, the Taoiseach who was one of the signataries on the account; and from Mr. Sean Flemming, a senior executive in the Fianna Fail party in the period following Mr. Haughey’s retirement as leader. Mr. Haughey has been asked to comment on the material to which I have already referred to and on the material to which I will now refer in slightly more detail but has made no comment. The allowance was paid monthly in installments by way of payable order made out to Mr. Cathal O’hEochaidh, TD. This explains why the payment for 1992 was a mere payment of £12,033 as Mr. Haughey was no longer the leader of the Party after February of that year. On the 16th June, 1989, a cheque payable to cash was drawn on the account, this time in the sum of £25,000. This was also signed by Mr. Ahern and Mr. Haughey. The Tribunal has not been able to obtain every cheque in respect of round sum withdrawals from the account. However, from the table I have just referred to, it will be clear that there were very substantial round sum lodgments in other years than the years in which the cheques I have just mentioned were drawn. Sorry, I should have just said where I used the word lodgments, I should have said drawings. For instance, in 1984, £50,400 in round sums were withdrawn. In 1985, the sum of £10,000 in round sums were withdrawn. In 1986, the sum of £50,000 and in 1989, the sum of £75,000 in round sums were withdrawn. During most of this time, the account was administered either in part or in whole by Ms. Eileen Foy. Ms. Eileen Foy was an employee of Fianna Fail from 1977, initially as Secretary to the Head of Research. She has informed the Tribunal that that at the time, the Research Office was part of the Leader’s office. The Leader was Mr. Jack Lynch. She has informed the Tribunal that the Head of Research was at that time responsible for the administration of the Leader’s Allowance and as the secretary to the Head of Research, she was involved in a lot of clerical administrative work in relation to the accounts through which the allowance was operated. She has informed the Tribunal that in 1977, when Fianna Fail went into Government, the Head of Research left the employment of the party and she became the Secretary to a number of backbench TDs and senators but she retained the function of administering the Leader’s Allowance, much as she had done when working as secretary to the Head of Research. In other words, it would appear that Ms. Foy continued to fulfill the function of administering the account notwithstanding the fact that she no longer reported to the Head of Research, but to a number of backbench TDs and senators. During this time, Mr. Lynch was still the Leader and he did not cease to be Leader until December of 1979 when he was replaced by Mr. Charles Haughey, TD. Following Mr. Haughey’s election to the leadership of Fianna Fail, Ms. Foy was asked by Mr. Haughey to work as secretary to the then Chief Whip, Mr. Sean Moore, TD. The Chief Whip’s office was attached to the Taoiseach’s office and Ms. Foy continued to operate the Leader’s Allowance while working as secretary to Mr. Moore. Fianna Fail were out of Government from 1982 to 1987 and, while in opposition, Ms. Foy began to work for Mr. Haughey and when Fianna Fail were returned to Government, Ms. Foy continued to operate as one of Mr. Haughey’s private secretaries until his retirement as Taoiseach and as Leader of Fianna Fail in February, 1992. During all that time, she continued to be responsible for the administration of the Leader’s Allowance. The day-to-day operation of the Leader’s Allowance entailed writing cheques on the bank account to which the payments from Central Funds were lodged. The writing of cheques from this bank account required two signatures. There were three authorised signatories on the account, Mr. MacSharry, Mr. Bertie Ahern and Mr. Haughey, but cheques required two signatories only. Ms. Foy was responsible for keeping the cheque books, preparing the cheques for signature and ultimately obtaining the signatures of the requisite authorised signatories on them. The actual payment of the Allowance was by way of a cheque in favour of the party Leader, in the case of Fianna Fail in favour of Mr. Haughey. Ms. Foy has informed the Tribunal that Mr. Haughey would endorse his name on the back of the cheque and give it to her to lodge in the Party’s bank account and these lodgments she made personally at Allied Irish Banks in Baggot Street. It appears that all debits from the account were by way of cheques written on the account. Ms. Foy has informed the Tribunal that she kept details of all cheques in a ledger in which she would note the date of the cheque, the payee, the sum, and the purpose for which the cheque was drawn; that during the period in which she operated the account, there were two or three ledgers. In addition, files were kept for some period of time but it would seem that as the office from which the account was administered moved from time to time, these may not have been retained as the records of the accounts were transferred from office to office. Also, Ms. Foy would have noted the payee and/or the purpose of the cheque on every cheque on the cheque stub as she was preparing the cheque. Neither the files, the cheque stubs, nor the ledgers are now available. Because the cheques to which I have already referred contain the signatures of Mr. Ahern and Mr. Haughey, Ms. Foy was asked to comment on the signing of cheques and she has indicated that although in addition to Mr. Ahern and Mr. Haughey, Mr. MacSharry was also a signatory, she did not recall asking him to sign cheques and would not have so requested him after he left Dublin on his appointment as European Commissioner in 1989. The system she used to obtain a signature on a cheque was that generally she would ask Mr. Ahern to sign a number of blank cheques in advance of her completing the details and that she would then retain those cheques until she had completed the details. Once the cheques had been completed by her, she would go to Mr. Haughey’s office with a list of the cheques, and the invoices to which they related and that Mr. Haughey would go through each item and that having satisfied himself that the cheques were in order, would then sign them. Ms. Foy’s recollection is that the cheques were used to meet a range of expenses out of the Leader’s Allowance of which the main areas were expenditure in respect of Research, Press, and Party Leader’s Office and the salary of people employed in that office. The Tribunal has drawn a number of cheque payments and withdrawals from the account to the attention of Ms. Foy. It is the cheque payments made out to cash on which Ms. Foy has been asked to comment. She has stated that she has no specific recollection of cash drawings from the account, nor any recollection of any purpose for which such cash sums may have been applied. However, she has informed the Tribunal that it is possible she may have cashed cheques for some of the round sum figures I have just mentioned. From the Tribunal’s point of view, if Ms. Foy did not cash these cheques, then it is a question as to how they were cashed and as to what use was made of the cash obtained. In the period during which Ms. Foy administered the account, that is during Mr. Lynch’s period in office and during Mr. Haughey’s period in office, there was no outside scrutiny or control of the Leader’s Allowance other than that of the Leader himself. In order to further scrutinize the manner in which cash monies appear to have been raised using cheques drawn on this account, the Tribunal has sought access to the various books in which the dealings on the account were recorded, i.e., the ledgers and files I have already mentioned. Ms. Foy has stated that she has no knowledge of what happened to the lodgers and other records after her resignation following Mr. Haughey’s replacement as Leader of Fianna Fail by Mr. Albert Reynolds, TD. Although all of the contents of Mr. Haughey’s office appear to have been put in boxes as part of his movement out of the Taoiseach’s office, Ms. Foy is not in a position to say whether these items were specifically included in Mr. Haughey’s boxes. Following Mr. Haughey’s resignation as Party Leader and the resignation of Ms. Eileen Foy, the administration of the account was taken over by Mr. Sean Fleming. Mr. Fleming proposed to the new Leader of Fianna Fail, Mr. Albert Reynolds, that the Party Leader’s account should be administered by the Fianna Fail Head Office and that the party would maintain separate books, records, bank accounts and financial accounts in relation to the account and that there would be a separate audit carried out on the funds from each accounting period. Mr. Fleming has informed the Tribunal that Mr. Reynolds agreed and the account has been operated along those lines ever since. The system now being operated as set up by Mr. Fleming originally entails the preparation of a list of payments at Fianna Fail Headquarters. This list with accompanying cheques which already have been made out is submitted to the Party Leader for signature and also to the second signatory for co-signature by him. If, due to their schedules, politicians are not available to sign cheques, then cheques would instead be issued on Fianna Fail Headquarters’ own account and, in due course, that bank account would be recouped out of the Party Leader’s account. In the ordinary way, full accounts are written up at the end of each year and these accounts are audited and reported on by an independent firm of accountants, Messrs Coopers & Lybrand. This system has continued in operation since Mr. Ahern became Leader. Mr. Ahern has provided the Tribunal with a Memorandum of Evidence concerning his involvement with the account during the tenure of office of Mr. Charles Haughey. He has informed the Tribunal that he has no recollection of ever having signed a cheque made out to cash in any significant amount. Mr. Ahern has informed the Tribunal that because of the volume of transactions through the account, combined with the necessity for the regular writing of cheques, a practice of pre-signing blank cheques was put in place for administrative convenience. A series of cheques would be pre-signed by a signatory on the account and thereafter the appropriate co-signatory would sign the cheque with the details of the payee and the amount of the cheque duly inserted thereon. Mr. Ahern has informed the Tribunal that he believed that as the account was being administered by a highly competent and efficient administrator and book keeper, the conduct of the account was believed to be proper and that, in addition, there was no evidence of any irregularity applying to the use made of the cheques which were drawn on account in this way. With respect to the cheque of the 16th June in the amount of £25,000 and made payable to cash, Mr. Ahern has stated that this cheque was drawn at or about the time of the 1989 General Election, which was held on the 15th June, and he has stated that he believes that the likelihood is that he pre-signed a series of cheques in advance of the election date to allow the account to be operated so that normal business and trading debts could be discharged promptly. Mr. Ahern has informed the Tribunal that the cheque does bear his signature, but that the writing of the word “Cash” and the amount “£25,000.00” both in numbers and in manuscript, is not in his writing and he believes that the cheque was one of the category of pre-signed cheques signed by him in accordance with the practice I have just described. So far as the other cash cheques mentioned already by me are concerned, Mr. Ahern’s position is the same in that he would not have signed them with any words or figures on them and that they must therefore have been pre-signed by him. Its attention having been drawn to the Leader’s Allowance and to drawings from that account, the Tribunal examined the credits to the Haughey Boland No. 3 account. That is the account already referred to in the Tribunal’s hearings from which payments were made to Mr. Haughey as part of the Haughey Boland bill paying service. The Tribunal has considered whether there is any connection between drawings from the Leader’s Allowance account and lodgments to that Haughey Boland No. 3 account. Firstly, on the 24th April, 1986, there was a credit of £10,000 to the Haughey Boland No. 3 bill paying service account, an account operated for the benefit of Mr. Charles Haughey and on the same date, there was a withdrawal by way of a cheque in the sum of £10,000 from the Leader’s Allowance account. Secondly, on the 29th October, 1986, there was a credit of £25,000 to the Haughey Boland No. 3 bill paying service account and on the same date, a drawing by way of cheque from the Leader’s Allowance in precisely the same amount, £25,000. The Tribunal will wish to examine this material from a number of different standpoints. Firstly, the Tribunal will wish to examine the account of the Leader’s Allowance as a potential source of funds in accounts operated for the benefit of Mr. Haughey. From the Statements made available to the Tribunal, it would appear that certain aspects of the operation of the Leader’s Allowance account will require further scrutiny in the course of the evidence. They are the fact that a number of cheques on the account, of which copies are now available, appear could have been drawn on the account payable to cash in large round sums. These cheques share a number of features. Firstly, there is now no record of the purpose for which the cheques were drawn. The Administrator of the account has no recollection of the purpose for which the cheques were drawn and cannot remember whether she herself was involved in the drawing of them or in the cashing of them. The cheques appear to have been cashed at Allied Irish Banks, Baggot Street, the branch of the Bank in which they were drawn. They appear to have been signed by the co-signatory Mr. Haughey after they had been signed by Mr. Ahern and Mr. Ahern appears to have signed them in blank. In circumstances in which one of these cheques for £25,000 payable to cash was lodged to an Amiens account controlled by Mr. Des Traynor, the Tribunal will wish to examine evidence to ascertain whether any of the other cash cheques could have been lodged to that account or to any other accounts for the benefit of Mr. Haughey and whether, in addition, other circumstances ought to be taken into account in answering these questions, including the circumstance that two large round sum withdrawals from the Leader’s Allowance account in 1986 correspond with two equivalent credits to the Haughey Boland account from which Mr. Haughey’s bill paying service was operated. While the Tribunal will wish to consider the aspects of the Leader’s Allowance I have just mentioned in the context of the sources of funds in accounts operated for the benefit of Mr. Haughey, it may also be necessary to consider the account in the context of payments made to Mr. Haughey. In other words, the examination of the account appears to be relevant both to Terms of Reference (a) and (b) of the Tribunal’s Terms of Reference. So far as Term of Reference (a) is concerned, that is to say the term of reference dealing with payments to Mr. Haughey, the Tribunal’s examination of lodgments to the Leader’s Allowance account suggest that between the year 1984 and 1992, with one exception, the lodgments appear to exceed the total amount of the Leader’s Allowance. The documentation and records available to the Tribunal has not enabled the Tribunal to examine precisely the correlation between individual lodgments to the account and the payment of individual installments of the Leader’s Allowance. For this reason, to distinguish between the total amount of lodgments in any one calendar year and the total amount of the Leader’s Allowance in any one calendar year, might not give precise indication of the excess of lodgments in the account in any one year over and above the amount of Leader’s Allowance for that year. However, in a number of years between 1984 and 1992, the amounts lodged appear to be substantially in excess of the amount of Leader’s Allowance for the relevant years and in 1986 and in 1991, they appear to have been in excess of the Leader’s Allowance to the extent of something in the order of £100,000 and in 1989, the amount seems to be in excess of the Leader’s Allowance in the order of £200,000, more or less. The additional lodgments appear to have been mixed with the installments of the Leader’s Allowance paid from Central Funds. From the information available to the Tribunal to date, it has not been possible to identify the source of these additional lodgments. However, to the extent to which they appear to constitute the funds of third parties, that is parties other than the State by whom the Leader’s Allowance was supplied, they may represent the source of payments to Mr. Haughey in those years. It is certainly a question as to whether any of the payments to Mr. Haughey or to the accounts for his benefit in 1986 and 1989 could amount to payments within the meaning of Term of Reference (a). A number of documents have been made available to the Tribunal by Irish Permanent Building Society on the basis that they appear to be relevant to the Tribunal’s Terms of Reference. Of the documents made available, two consist of cheques drawn on Irish Permanent Building Society’s account with the Bank of Ireland in favour of Mr. Charles Haughey. Each of these cheques was dated the 7th June, 1989. One is in the sum of £20,000 and the other is in the sum of £10,000. Each of these cheques was made payable to Charles Haughey and each of them was signed by the same two directors of the society, namely Dr. Edmund A. Farrell and Mr. Enda Hogan. These cheques appear to have been lodged to the Dublin Airport branch of the Bank of Ireland. Each of the cheques was paid on the 15th June of 1989. Mr. Haughey has been asked to comment on the cheques and on the fact that they were so lodged but has, to date, not done so. Celtic Helicopters, a company which has featured in the proceedings of the Tribunal already, has an account at that Bank’s branch at Dublin Airport. An examination of the Celtic Helicopters account at the Dublin Airport branch of the Bank of Ireland indicates that the sum of £30,000 was lodged to that account on the 7th June of that year. It was withdrawn some short time later on the 21st June. The withdrawal was by way of a cheque. The Tribunal does not have a copy of that cheque. At the time of the payments to Mr. Haughey on the account of the Irish Permanent Building Society, the Society made a number of other payments to the three largest political parties, i.e. Fianna Fail, Fine Gael, and the Labour Party. These payments appear to have been connected with the then impending General Election. The payment to Fianna Fail was for £65,000, Fine Gael was £25,000, and the payment to the Labour Party was £10,000. The cheque stubs corresponding with each of the cheques describe the payments as follows: To Fianna Fail and Fianna Fail parties as “Subs”. The payment to the Labour Party is described as “Contribution”. The payment for £10,000 to Mr. Charles Haughey which appears to have been lodged to the Bank of Ireland Dublin Airport account of Celtic Helicopters, is described on the cheque stub as a “Sub”. The cheque for £20,000 made payable to Mr. Haughey and which also appears to have been lodged to the Celtic Helicopters Dublin Airport Bank of Ireland account is described as “B. Lenihan”. In the accounts of the Irish Permanent Building Society, the document which appears to be in the nature of a cheque journal or analysis book refers to each of the four payments I have just mentioned. They are described as “Political Subs”. No distinction is made in the entries on the journal as between the political parties nor is any reference made to Mr. Charles Haughey himself. The Tribunal has sought information from Dr. Edmund Farrell and Mr. Enda Hogan, the signatories on the two cheques. Dr. Farrell is endeavouring to obtain further documentation in order to assist the Tribunal and will be in a position to provide a Statement or a Memorandum of Evidence at that stage. A Statement has been furnished to the Tribunal by Mr. Enda Hogan, the other signatory of the cheques. Mr. Hogan has informed the Tribunal that each of the cheques was signed by him after they had been signed by Dr. Farrell. He has informed the Tribunal that he has a recollection that at some time he was told by Dr. Farrell that the late Mr. Brian Lenihan was going to undergo a liver transplant operation and that Dr. Farrell thought that the Irish Permanent should make a contribution towards his expenses. This is Mr. Hogan’s response to the fact that the cheque stub in respect of a cheque for £20,000 made payable to Mr. Charles Haughey contains a reference to “B. Lenihan”. Mr. Hogan does not, however, appear to have been aware of this at the time the cheque was countersigned by him. He has no recollection of countersigning the cheque payment for £10,000 to Mr. Charles Haughey but assumes that it was a political contribution. Mr. Hogan has also informed the Tribunal that shortly after he joined the Society in 1983, he recommended that if any political contributions were to be made to the Fianna Fail party, contributions should also be made to the Fine Gael Party and the Labour Party. He has also informed the Tribunal that the decision as to the amount that each party should receive was made solely by Dr. Farrell and also that, as far as he is aware, all requests for political contributions were handled by Dr. Farrell and that his, Mr. Hogan’s, only function was to countersign the cheques and that he dealt with no person other than Dr. Farrell in relation to any of these requests for political contributions. Mr. Hogan as also informed the Tribunal that he is not aware whether any other members of the Board of the Society or any Executive of the Society was aware of the writing of the cheques or of the beneficiaries of them, apart from Ms. Margaret Coyle, Dr. Farrell’s secretary. He has also informed the Tribunal that he understands that there is no reference in the Board Minutes to any of these payments and has stated that it would have been normal at the time for Dr. Farrell to make decisions on these matters without reference to the Board. The Tribunal will wish to examine whether there were any other payments by the Building Society or by any of its Directors to Mr. Haughey and whether the payments I have just mentioned in the amount of £20,000 and described as being for “B. Lenihan” was used for the purpose envisaged or for some other purpose.